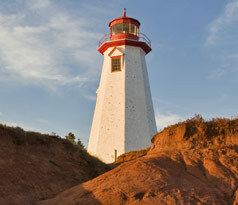 PEI’s Green Gables Shore and Red Sands Shore join to create the Island’s Central Coastal Region. Bordering on Prince Edward Island’s two cities – Charlottetown and Summerside – on either side, this drive circles the core of the Island, with Green Gables highlighting the north central region and its coast, and Red Sands highlighting south central PEI. Follow this route, and you’ll find yourself at some of the Island’s finest beaches, and at the birthplace of author Lucy Maud Montgomery and the inspiration for her most famous creation, Anne of Green Gables. Picturesque fishing villages, fresh seafood and pristine beaches are on the route, along with one of the Island’s most photographed icons – the Confederation Bridge. Click below to view our Central Coastal Drive listings.